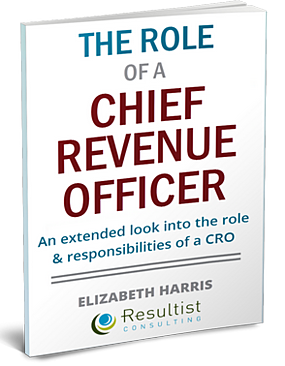 An extensive look into the role and responsibilities of a CRO. This ebook will help you study and define the role of a Chief Revenue Officer in depth which should prove the job of a CRO is more than just a glorified VP of Sales. Accelerating the Sales Learning Curve. Sales - but also for customer (vs. user) marketing. Marketing Strategy and Sales Tactics. Building, scaling, the tuning the revenue model. Designing, training and scaling the revenue organization. Drive adoption among paying customers. increasing margin and driving the future growth of the business. A Chief Revenue Officer’s (CRO) role includes marketing, sales and business development and may be asked to take on customer success that includes responsibility for the key customer-facing functions. A CRO will be passionate about every customer touch-point, and have an ability to align customer success, and sales executives comp plans, as well as marketing, sales and business development execs' comps. The CRO with a broader role can resolve issues faster because of "one" unified revenue perspective. Hopefully, the CRO will consider their job more than one as a glorified VP of Sales. With a more thorough understanding of the CRO role, you will be better prepared to develop your company’s business model, ensuring market sizing, Go-To-Market strategy, pricing and packaging, sales skills and organization model. Not everyone understands how to optimize the customer journey from an unknown lead to an expanded account, while staying in alignment with the company's bigger vision. The free ebook is extensive, very thorough and for you if you are one who wants to “conquer” the role.